On stage last week in Nassau, Bahamas, where I was the closing keynote speaker for a global investment/wealth management firm. What a wonderful event! What a wonderful part of the world! The quote? It’s one I actually used shortly after that slide section finished up. 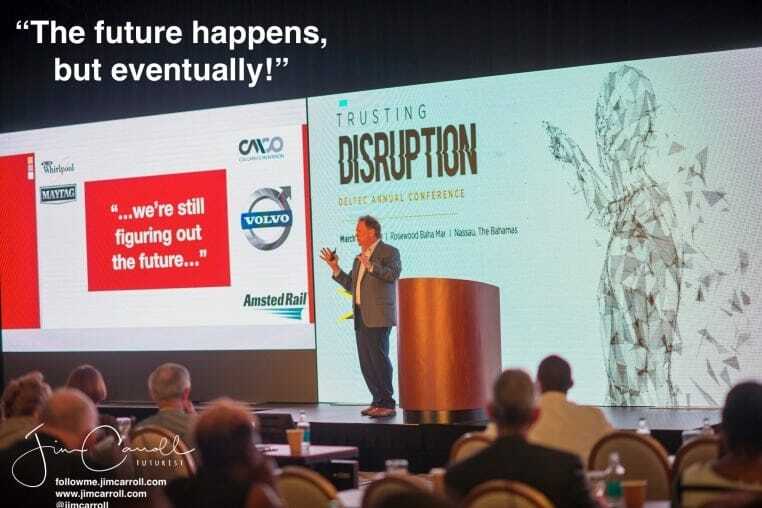 The point I was making that I spend my time with a vast number of Fortune 1,000 organizations, speaking at leadership meetings they host offsite to examine a few critical future trend issues. These organizations are very much in the mode of working to align themselves to fast paced trends – whether it be 3D printing, blockchain or the Internet of Things – but given the complexity of new architectures, business models, systems integration and strategy, it takes some time. People have expectations that the sometimes the future just happens suddenly, and it most certainly can. But it can also take substantial time to evolve and come about, particularly with complex, transformative trends like the ones just mentioned. It goes back to the issue of timing, which I find I’m speaking about on stage more and more frequently. As so as they say, timing is everything, particularly when it comes to the issue of getting involved in any particular trend. In the era of acceleration, it becomes even more critical. You’d better make sure you are ready with any trend of importance and relevance, because the future might happen before you know it.